"Chapter 12 with Nina Rosenstand and Anita Silvers." Includes index. Mayfield Publishing Co ,U.S, 1989-06-01. 2nd. Paperback. Used:Good. Mayfield Publishing Co ,U.S, 1989-06-01. Paperback. Good. McGraw-Hill Education. PAPERBACK. 0078119146 New Textbook, Ships with Emailed Tracking from USA . New. McGraw-Hill. PAPERBACK. 0078038286 New Textbook, Ships with Emailed Tracking from USA . New. McGraw-Hill Humanities/Social Sciences/Languages, 2011-01-11. Paperback. Good. McGraw-Hill. PAPERBACK. 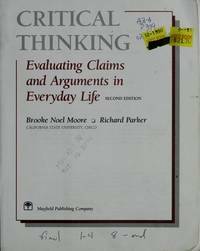 0078038286 US Edition Textbook, May Have Highlights, Notes and/or Underlining, BOOK ONLY-NO ACCESS CODE, NO CD, Ships with Emailed Tracking from USA . Good. McGraw-Hill Education. LOOSE LEAF. 1259690873 Special order direct from the distributor . New. McGraw-Hill Education. LOOSE LEAF. 1259690873 NEW TEXTBOOK, SHIPS WITH EMAILED TRACKING FROM USA . New. McGraw-Hill, 2012-01-01. 10th edition. Paperback. New. Factory sealed, with access card. McGraw Hill Higher Education, 2011-07-01. Paperback. Good. McGraw-Hill Education. LOOSE LEAF. 1259690873 US Edition Textbook, May Have Highlights, Notes and/or Underlining, BOOK ONLY-NO ACCESS CODE, NO CD, Ships with Emailed Tracking from USA . Good. McGraw-Hill Education, 2014-01-15. Paperback. Used:Good. McGraw-Hill Education, 2016-10-25. Loose Leaf. Used:Good. McGraw-Hill Education, 2016-10-25. Loose Leaf. Good. McGraw-Hill Humanities/Social Sciences/Languages, 2011-01-11. 10. Paperback. Used:Good. McGraw-Hill Education. LOOSE LEAF. 1259690873 Item in good condition. Textbooks may not include supplemental items i.e. CDs, access codes etc... . Good. McGraw-Hill Education. LOOSE LEAF. 1259690873 Item in good condition and has highlighting/writing on text. Used texts may not contain supplemental items such as CDs, info-trac etc... . Good. McGraw-Hill Humanities/Social Sciences/Languages, 2005-12-02. 8. Paperback. Used:Good. McGraw-Hill Education. PAPERBACK. 0078119146 New Condition. . New. McGraw-Hill Education. PAPERBACK. 0078119146 Like New Condition. . Fine. McGraw-Hill Education, 2016-10-25. Softcover. New. ***International Edition***Soft cover/Paperback*** Textbook printed in English. ***Brand New***. International edition has different ISBN and Cover design. All textbook arrives within 5-7 business days. McGraw-Hill Education. PAPERBACK. 0078119146 US Edition Textbook, May Have Highlights, Notes and/or Underlining, BOOK ONLY-NO ACCESS CODE, NO CD, Ships with Emailed Tracking from USA . Good. McGraw-Hill Education, 2014-01-15. Softcover. New. ***International Edition***Soft cover/Paperback*** Textbook printed in English. ***Brand New***. Most international edition has different ISBN and Cover design. Some book may show sales disclaimer such as "Not for Sale or Restricted in US" on the cover page but it is absolutely legal to use. All textbook arrives within 5-7business days. Please provides valid phone number with your order for easy delivery. 2000-04-04. Good. Ships with Tracking Number! INTERNATIONAL WORLDWIDE Shipping available. May not contain Access Codes or Supplements. May be ex-library. Shipping & Handling by region. Buy with confidence, excellent customer service! McGraw-Hill Humanities/Social Sciences/Languages, 2014-01-15. Paperback. Good. McGraw-Hill, 2007-08-01. 7th. Paperback. Used:Good. Mayfield Pub Co, 1994-09-01. 4. Paperback. Used:Good. McGraw-Hill. PAPERBACK. 0072818816 New Condition. . New. Mayfield Pub Co. PAPERBACK. 1559348364 New Condition. . New. Mayfield Pub Co. PAPERBACK. 076741067X New Condition. . New. Mayfield Publishing Company. PAPERBACK. 0874847346 New Condition. . New. McGraw-Hill Humanities/Social Sciences/Languages. PAPERBACK. 007312625X New Condition. . New. McGraw-Hill. PAPERBACK. 0078038286 Item in acceptable condition including possible liquid damage. As well, answers may be filled in. Lastly, may be missing components, e.g. missing DVDs, CDs, Access Code, etc. . Fair. McGraw Hill Higher Education. PAPERBACK. 1259253953 Good condition international edition textbook. . Good. Mayfield Pub Co. PAPERBACK. 1559348364 Like New Condition. . Fine. McGraw-Hill Humanities/Social Sciences/Languages. PAPERBACK. 007312625X Like New Condition. . Fine. Mayfield Pub Co. PAPERBACK. 076741067X Like New Condition. . Fine.